Liszt made several settings of all or part of the Ave Maria. Fortunately, they are each in a different key, which helps with identification! The E major piece is not connected with a vocal work, and, although the rhythm fits the opening of the text the ecclestiastical connection remains general. The subtitle ‘The Bells of Rome’ may not be Liszt’s, but the bell effects are specifically indicated. 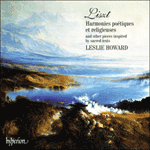 The piece was composed for the piano method of Lebert and Stark. The Ave Maria (d’Arcadelt) was issued with the Alleluia, although the key is really the only thing the pieces share. The Alleluia is based on material from the choral work Cantico del sol di San Francesco d’Assisi, whilst the Ave Maria is Jacques Arcadelt (c1505–1568) twice removed. Louis Dietsch (1808–1865) produced the piece in 1842 as an Arcadelt discovery, but was subsequently shown to have adapted the text of the Ave Maria to Arcadelt’s three-voice chanson ‘Nous voyons que les hommes’. 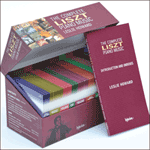 Liszt added the rocking accompaniment in his transcriptions for piano and for organ. The D major Ave Maria was one of nine motets issued in 1871. This transcription (also the one for organ) is very straightforward, but the D flat version is extended with a florid variation. The tiny G major piece is adapted from a late vocal work, and the B flat version in the Harmonies poétiques is adapted from Liszt’s first choral setting of the text.